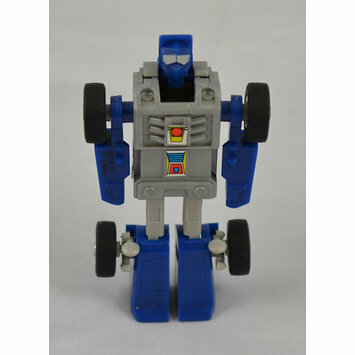 Beachcomber is an Autobot mini-vehicle, introduced in 1985 the second tranche of this cheaper sub-group of toys. His role with the Autobots was that of a geologist, and he was characterised by his extremely laid-back and peace-loving personality. Ironically, given his pacifist nature, his alternate mode was that of a heavily-armed military vehicle. Transforming toy, a small robot which can be changed into a four wheel drive M1040 Chenowth "Hellfire" Fast Attack Vehicle. It is made from injection-moulded plastic, it has blue limbs and head (with silver painted eyes), a grey torso and a black roll cage. In car mode it runs on four black rubber tyres. The toy is decorated with printed paper stickers. Bought by the donor between 1985 and 1987. Mr Dacas was born 17/10/73 and saved his pocket money to buy the toys. Transformers are alien robots hailing from the planet Cybertron, all of them are capable of assuming an alternate form, usually a vehicle, through a series of folding movements. They are typically divided into two factions: Autobots and Decepticons. The Autobots are heroic, peace-loving and curious about humanity, they are led by Optimus Prime, who typically transforms into an articulated truck. The Decepticons are evil, authoritarian and contemptuous of other life-forms, they are led by the maniacal Megatron, who originally transformed into a realistic-looking handgun. 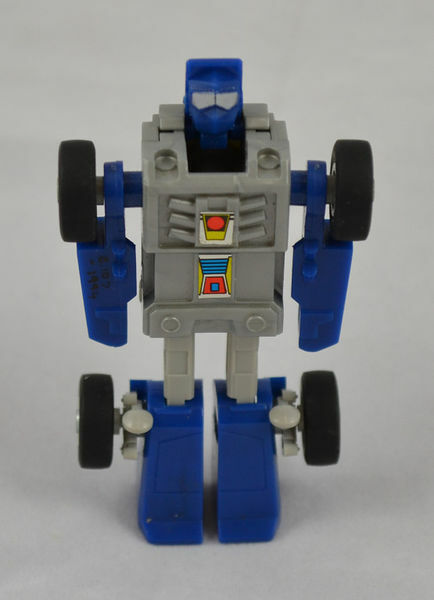 Initially, the franchise was essentially an American rebrand of two toylines already produced by Japanese toy manufacturer Takara Tomy: ‘Diaclone’ and ‘Microman’. Hasbro had purchased the distribution rights to these lines in the early-1980s. Transformers was launched in the United States and Europe in 1984-85. The enormously popular toys inspired many spin-offs, including several animated television series’, a feature-length animated film (1986), multiple comic books series (including by Marvel, who had co-operated with Hasbro to produce GI Joe comics) and, inevitably, subsequent lines of toys. A series of big budget, live-action films have been produced by Warner Brothers since 2007.